Pattanam (N. Lat. 10º 09.434'; E. Long. 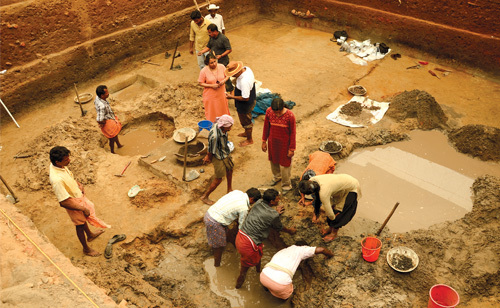 76º 12.587') is the first site of multi-disciplinary excavation undertaken in the state of Kerala. Located in Chittatukara Panchayat, Vadekkekara village, Pattanam lies between Kodungallur and North Paravur in the Periyar Delta, Ernakulam district. Pattanam appears to have been an integral part of the ancient trading port of Muziris/Muciri Pattinam. As a trans-oceanic hub, the region finds copious mention in various Indian and European classical texts. The nine seasons of excavations (2007 - 2015) by the KCHR have unearthed a large volume and array of Indian and non-Indian artefacts belonging to different cultures and cultural periods. The chronology of the Pattanam site spans three millennia from circa 1000 BCE with evidence of habitation across the Iron Age, the Early Historic, the Medieval and the Modern cultural periods. The Early Historic period (3rd century BCE to 5th century CE) seems to be the most active phase of the site. Pattanam mound, covers less than 1% of the 111 hectares of the mound. The Pattanam excavations have unearthed 130,865 artefacts, circa 5,16,676 diagnostic potsherds (i.e. rims, necks, handles, bases etc. of pots), 141, 348 non-Indian pottery sherds and circa 4.5 million local body sherds. The features (immoveable elements) excavated include foundations of brick architecture, burnt clay floors, a wharf in a water logged context with a 6m long canoe and bollards (dated to 1c BCE- 1 c CE); ring wells, toilet features, storage jars, and a kiln context. The botanical remains include rice, black pepper, cardamom, frankincense, peat, bark, charcoal, leaves, roots, seeds, wood and pulses. The zoological remains are bone fragments and teeth. The geological remains consist of a range of local and non-local rocks and stones.